Do not lose hope, please believe that there are a thousand beautiful things waiting for you. Sunshine comes to all who feel rain. 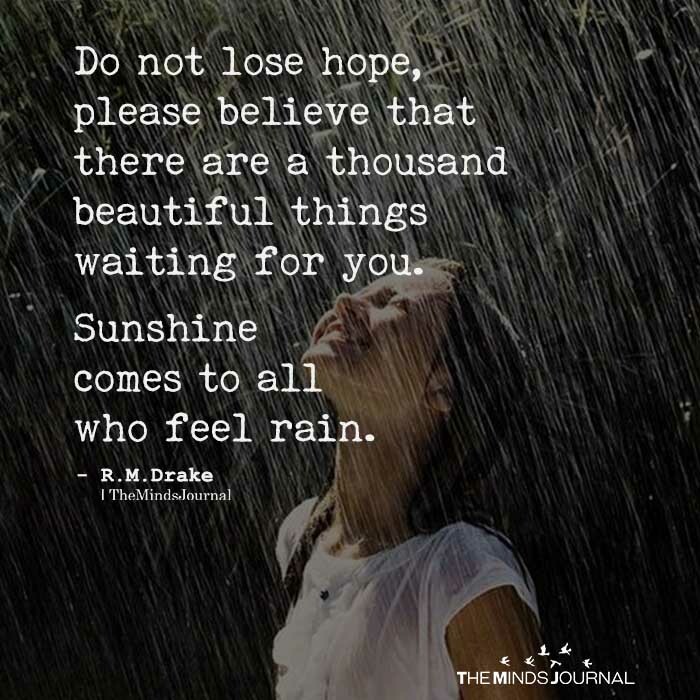 Hope is powerful both ways. That can alter day to day based on whether or not you can accurately interpret what you feel internally. But for right here in this very moment, identify ways to assume accountability for where you are now no matter the reason. Afterwards, faith will have a better foundation to build on. But to resort to faith before responsibility results in extreme chances of creating a victim of yourself. And that is a long detour of unnecessary turmoil. Does little good to immediately jump to claiming unmeasurable “faith” from a post on Facebook that conveniently said exactly what you wanted to hear while requiring zero effort from your untapped potential of the ability to create greatness from the little that you already have to draw from. Sheila Giwékwé Kelly And you know that to be true how? Or do you just believe it!? Don’t get me wrong, I hope what you’ve written works for you. I personally love the rain, it relaxes me.